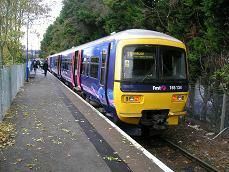 Name of Line: The Marlow Line ? Due to problems with a broken down train at Ealing I arrived with over half an hour to spare at Maidenhead. This meant sitting in the waiting room and eating my sandwich lunch whilst I waited for the train from Marlow to arrive. 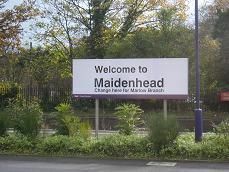 Maidenhead station is a five-platform station, with three of its platforms in use, whilst the other two are where the express trains speed through. By the train arrives there are around twenty people waiting to board it. We leave on time and leave the mainline behind straightaway as we turn north westwards along a single sweeping curve. We move into a leafy cutting, which soon turns into an embankment with views across the industrial estates of Maidenhead. We then slow down for a level crossing before coming into Furze Platt station, which is still part of Maidenhead. It has the bare essentials of a station - platform, shelter and not much more. Moving on we continue through more housing on either side of the track before coming out into open countryside, which is mainly rough grazing with woodland in the distance. The track is very bumpy here as we journey through to Cookham, where the old station building on the opposite side of the track is now a private house. The main station building on the single platform is in good order with a waiting room with a large table in the middle of it next to the ticket office. As we move away from Cookham station we enter a cutting with lots of dead leaves by the track side, before emerging into open land once more. This time there seems to be a golf course on either side of the track. The all of a sudden you can see the river Thames in the distance to the right with large detached houses nestling on its bank. As we get nearer the river we rise up slightly onto a bridge over the river and then we come into Bourne End station. 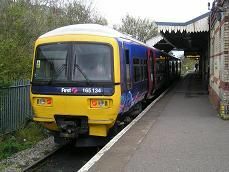 It has two platforms and the track originally continued here through to High Wycombe, but now it is dead end and the train makes a four-minute stop for the driver to change ends. Most of the passengers alight here, so the train seems virtually empty, apart from myself and a couple of other passengers. There is the original station building which house the ticket office and another station building on the opposite platform, which is now the Bourne End Auction rooms. We pull away and veer to the right, slowly going over a succession of level crossings before travelling at a faster pace alongside the northern bank of the river Thames. There are a variety of houses in different styles dotted along the riverbank with one or two deliberately built up form the bank in case flooding should occur. Various small lakes or filled in gravel pits are on both sides of the track and these give way to more houses and small factories as we come into Marlow station. It's a single platform with absolutely no seats of shelters, a very sorry state for an end of the line station. There's some wasteland to the south of the platform, which presumably was once the goods yard. Surprisingly this hasn't yet been turned into a commuter's car park. There's a wait of just of seven minutes for the change round before the train pulls away from Marlow and goes back to Maidenhead.